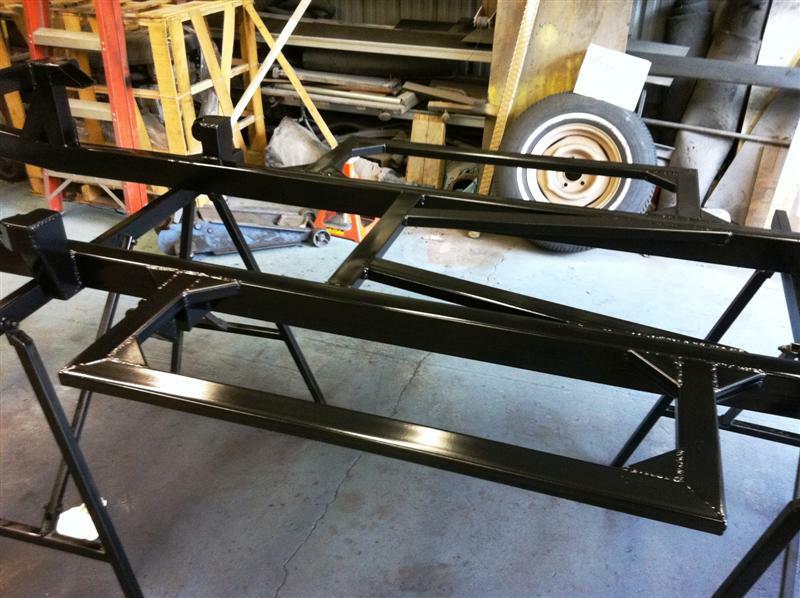 bowtie6‘s New Frame – Check It! The new custom frame is done. The frame looks different from the original setup. This was done for several reasons, but mainly for strength. The next was the ability to mount the rear solid axle. One of the main concerns I always had in the back of my mind was whether the hubs/halfshafts would fail. This time, the new axle will handle all the power on tap with no reservations. This time, the diff is posi-traction with a 3.80 to 1 ratio. The rear calipers I had on the old frame have been adapted to work with the new axle. As you will see, the front calipers are the same Wilwood’s from the original build. The original mounts were retained. All brake lines going to the calipers are the ones used in the past build – braided teflon lined. And, there is also a picture below showing the location of the Wilwood proportioning valve. All brake lines have been scratch made from stainless tubing fitted by hand. They look killer! Coilovers have been used on all four corners. This part took a bit of research and the spring rates took some careful consideration. These are the same settings used on my cousin Jim’s TR4. Not only do they look awesome but they perform equally well. They are quite pricey but just the fact there will not be any more spring compressors involved makes it worth the trouble. The ECOTEC 2.4 engine is now mounted using the original Solstice mounts. Special pads were made to go on the frame and this is where the mounts anchor. Ditto for the transmission mount. This is all done with a very specific purpose: to make room for the exhaust and have nothing ‘hanging’ below the frame. There is a ton of more subtle details – I am sure you will find them. If you have any questions/comments drop me a line. Here is the new frame gallery. Enjoy! This entry was posted in 1. bowtie6, Bespoke Frame and tagged bowtie6, coilovers, frame, TR6 disc brakes on 02 May, 2011 @ 20:25 by bowtie6. It is done. Took a few hours of work but the new frame is now fully painted. I used a nice chassis black paint – should be nice and durable. The stuff was not too terribly expensive so I shot a generous amount and now it is only a matter of time for it to fully dry. Here is the rear section of the frame. These are the rear towers that will hold the coilovers. The axle sits ahead of this, over the frame. The uprights brace should tie all this together nicely – the idea here is not to have any flexing going on. Next is another shot of rear section of the frame. The tower braces show the tabs where the coilovers will mount and also on the lower side, the ties for the control arms that will hold the rear axle in place. Finally, the midsection. This is where the transmission will rest. The square sections off the frame will be used to hold the body in place. This entry was posted in 1. bowtie6, Bespoke Frame and tagged bowtie6, frame on 09 Apr, 2011 @ 20:45 by bowtie6. I’m chomping at the bit… bowtie6‘s new frame is complete and ready for paint. It is stunning. Sorry – no pictures today but there will be plenty tomorrow. I saw the frame yesterday and it is very impressive. My cousin Jim took the frame to the fellow that does the media blasting for us and had the thing cleaned up. The frame is now back at the shop, gray as can be and just begging for primer and paint. Tomorrow should be a fun day: I’ve got primer, a gallon of chassis-black (with the matching hardener) and my HVLP guns locked and loaded. 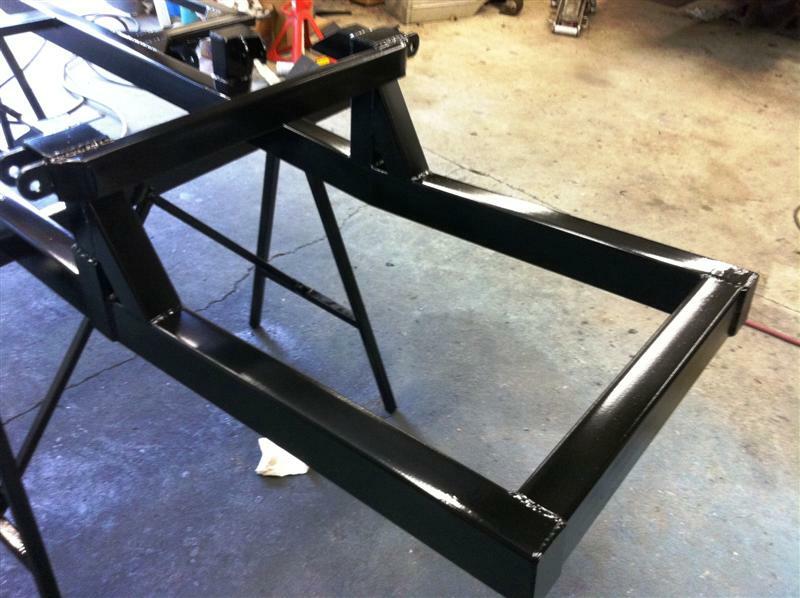 The goal is that by EOD tomorrow, the new frame should be thoroughly coated with paint and looking like a supermodel wearing a little black dress. New bushings for the front suspension have been ordered from the UK. The new ones are of much greater quality and more durable than the polyurethane bushes currently used. Why? After only 15,000 miles the ones I had bought have become ‘worn’. Not good. Adjustments to the steering column. Ready for this? bowtie6 will have full tilt steering. Yes. Tilt steering!! Should be a nice addition – I’ll have more on this too! This entry was posted in 1. bowtie6, Bespoke Frame and tagged bowtie6, frame, tilt steering on 08 Apr, 2011 @ 18:51 by bowtie6.